Did you guys see the Spain- Germany game? I secretly wanted Spain to win and voila they did. 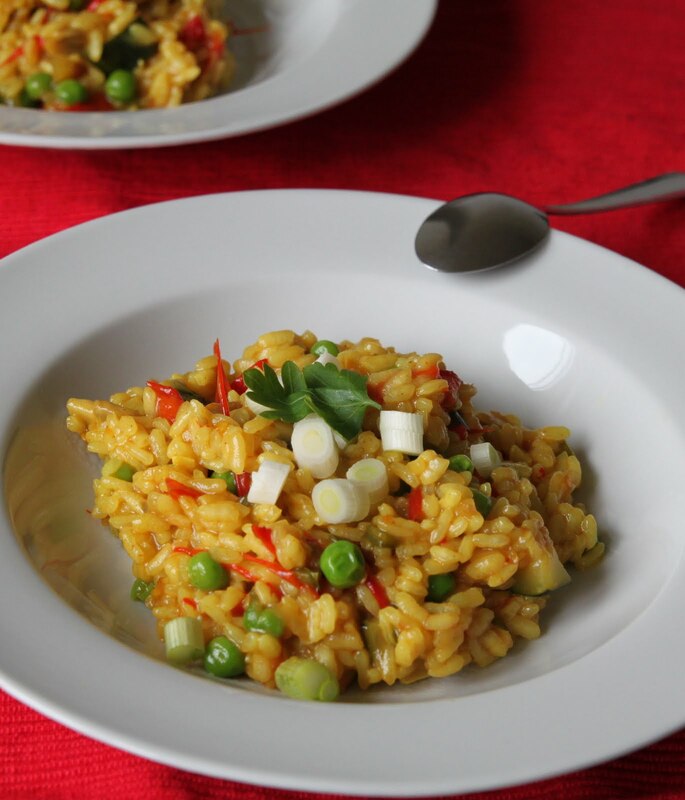 And as coincidence would have it, I made this Spanish favourite of ours today, and what better way to say 'way to go Spain' than with this utterly delicious all in one paella (pronounced paeya), a wholesome meal. I was introduced to Spanish food two years back and there was no looking back. However, it was the Chorizo and seafood paella at Borough Market (Monchichi of 'Not another big menu' has given a nice description of Borough Market) that blew my mind away. Ro and myself used to frequently have lunch dates at Borough Market and if it wasn't the Thai curry stall, then it was definitely Paella and Sangria for lunch on Fridays. I never in my dreams thought I'd actually attempt making paella at home, but after doing some research online, I decided to give it a shot anyways, only to realize its one of the easiest meal preparations, especially because you can add in veggies and meat and what not and have it on its own. There was no hassle of gravy or side dish, just a glass (well a bottle in our case) of Rioja wine and we were happy! Now, I have made two versions of it. One is the veggie version and the other a chorizo and shrimp version, both equally tasty and not out-of-the-way difficult. Heat the olive oil in a container (big enough to hold the rice) and sauté the onions till soft and fragrant. Add the garlic and continue sautéing for a few more minutes. In goes the courgette, red pepper, mushrooms and jalapeño pepper. Cook on medium heat till the veggies are slightly cooked, stirring in between. Add the chopped tomatoes and keep stirring. Cook till the oil starts to separate. Add the paprika, turmeric and cumin powder, dried chilli flakes and salt. Combine well, making sure the veggies are all coated well. Add the paella rice and mix well, stirring for about 3 to 4 minutes, till the rice begins to slightly crackle. Add the hot stock/ water at this point. 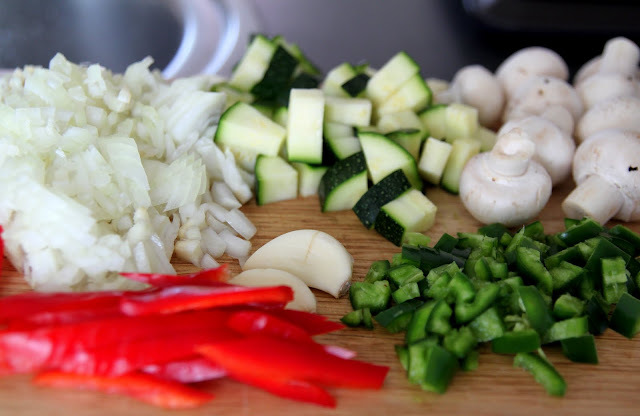 Give it a mix, close the lid and cook on medium to high flame till the rice is cooked through. If its starts burning or sticking to the vessel, pour some more water. Its ok if the mix is lightly mushy and loose, that's how the consistency should be. Check for salt spice, add if required. Add the frozen peas towards the end, about 3 minutes before you take it off the flame. Stir well and just before serving throw in the scallions and garnish with parsley leaves. 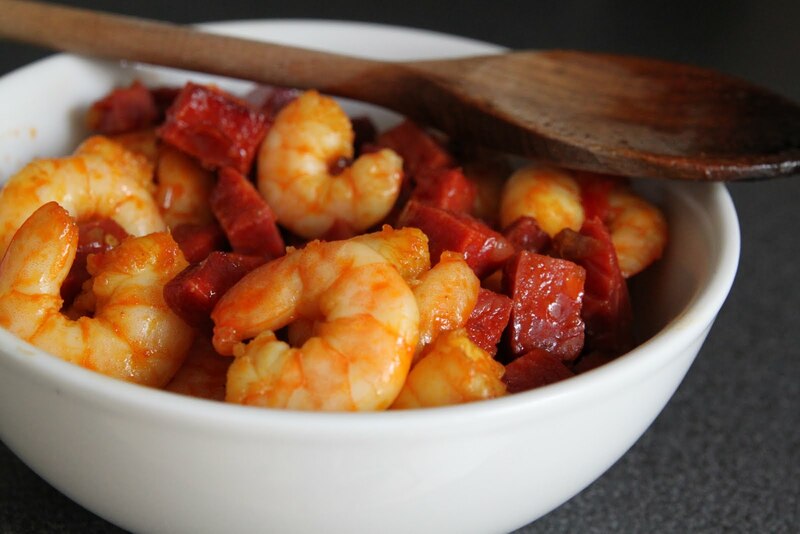 In a frying pan, cook the chorizo slices for 5 to 6 minutes or until soft. Add the shrimp to this and cook on high heat for a few minutes. The oil oozing out of the paella will give a nice flavour to the shrimp and will also cook it. Drain on paper towels. Keep aside. At the stage where you add the green peas to the rice mix, add the cooked chorizo and shrimp and give it a final stir. Notes: Any vegetable of your choice can be used, for example, zuccini, asparagus, beans etc. I did not have stock with me, so I used water. It turned out perfectly fine. Next time however I would like to add about a half cup white wine as well. Paella is actually made in a paella dish which I didn't have. I guess a heavy-based saucepan would be your closest bet. Sending the Mixed veg. 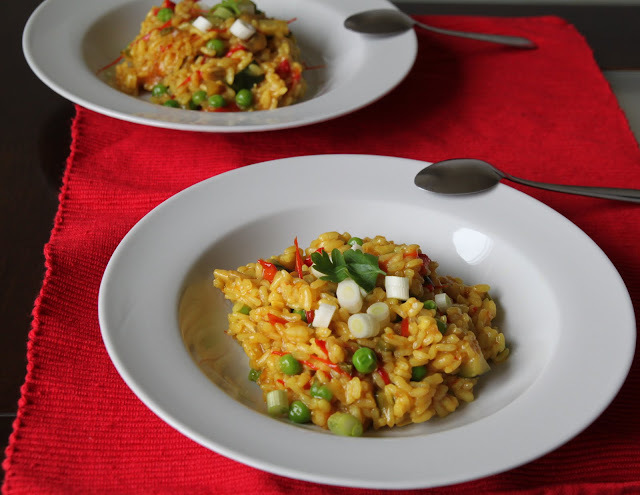 Paella to the AWED-Spain event hosted by Priya this month, brain child of DK of Chef In You. The veg one looks mouth watering. I am surely making it. we loved both the versions and pictures are too good da...Looks so so tempting and eye catching color..
i was looking for an easy recipe since I saw this on TV. U have a perfect one. will soon try it. thats for sharing. love the wonderful colours. nice snaps too. Never had a chance to taste Spanish dishes.. This looks delicious..
paella rice looks so lovely n looks so inviting....looking @ the gorgeous color ate with eyes.first...loved both the versions...both look yum.. Both looks fantastic...Gosh..Now Im REALLY hungry! Droolworthy paellas, love both versions, cant take my eyes from both dishes, very tempting..
Love it .. Looks incredibly good .. Being aveggie I will vote for the veggie version .Both look devine colourful and tasty. Gorgeous photos - good enough to eat! Never tried vegetarian version of paella, looks very colourful. good to know a fellow blogger from UK!! Nice recipe.. and wow.. wot lovely clicks..... Following u from now on!! Do take a sneak a peek at my blog whn time permits! Love bot the versions but I would reach for non-veg first cause love shrimps and love chorizo. Yum! Dish looks so elegant and delicious..liked both versions. I never expected Spain to win yst after the germans win over Engalnd..Anyway Since I dint bet anywhere I dont mind who wins or loose.By the way ur paella looks sooooooo lovely.I defintely shude try this out,bookmarking this one.Being lazy I am not sure when I am going to try,anyway will let u know if I try it out soon. i can’t stop drooling…OMG, I want some!!! As usual beautiful pics.. loved the last pic... loved the presentation..
Lemme'know R u a supporter of the Spanish Soccer team....exprmntng with Spanish dishes.....?!. wow really delicious one.. its really good to share the both veg and nonveg versions of paella. really yummy one. What a coincidence! I made paella with chorizo, shrimp, and chicken a few days ago. 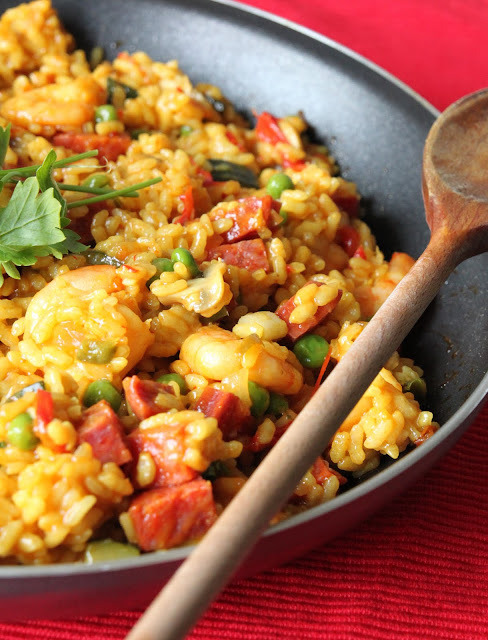 Your paella looks fantastic! Great photos. WOW!! What a tempting dish, Nisha!!! Fabulous clicks..Bookmarked!! Will try it soon..
First time to your blog, beautiful space and good presentation. Following you to get more of your recipes and more. But after seeing ur post and you assuring that its not that tough I think I'll give it a try. 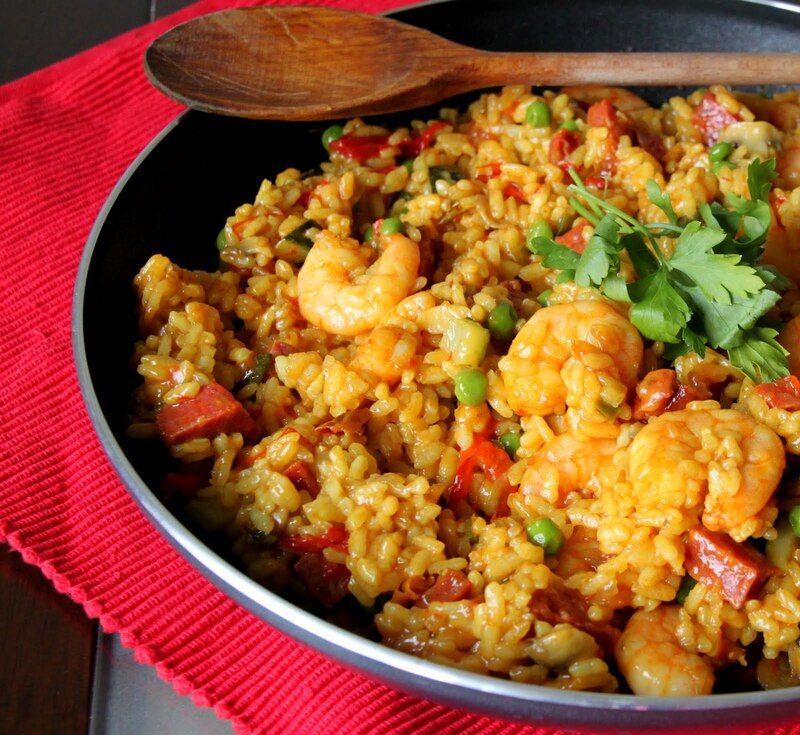 Paella looks yummy, love the combo of veggies used, delicious! paella with sangria! i am game on any day :D awesome clicks too. never knew paella was so easy to make at home.. i have got to try this soon. which wine did you pair it with? Loved the shrimp version, looks really tempting...beautiful clicks. oh My..this makes me drooling!!!!! I could kill for a meal like this right now! I LOVE paella, the colour always makes me feel happy. I never make my own though but not sure why?! Your paella looks great! If you ever visit Spain come to our Paella cooking class! !